The opening credits play over an orchestral overture, jaunty and melodic, setting the scene for an adventure in the magical land of exotic fairytale cliche. 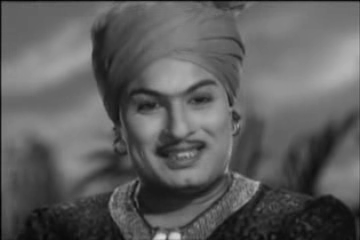 Baghdad Thirudan is in the style of a Hollywood swashbuckler, and T.P Sundaram directs this rollicking yarn written by A.S. Muthu. The film is on Youtube in pretty poor quality and without subtitles. There is no shortage of plot, but once you identify the Goodies and the Baddies (not hard) the story is easy enough to follow and bounds from incident to episode with great spirit. There is the kingdom that must be restored to rights, justice for the oppressed masses (maybe), a love triangle of sorts, DIY special effects and stunts, abundant songs and lots of excellent outfits. The action opens with HELEN! Or someone who looks a lot like HELEN! She dances and a gaudily dressed man (T.S. Balaiah) can barely keep his hands off her. He and his wife scheme to depose the king and queen and take over the kingdom. He really has no impulse control. 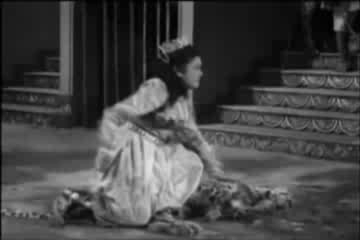 The king and queen are captured and the maid taking their baby son to safety has to get past…a leopard! She actually fights and kills a leopard barehanded. Without mussing up her outfit. But that’s not all. She duels with soldiers with the baby still tucked under her arm – finally being stabbed in the back and dropping the baby from a tower into the waiting arms of a fellow retainer who completed the rescue and drew the pursuit away. Awesome stuff. I read that actress S.N. Lakshmi was afraid of the leopard (and of cats in general) but still had to get in there without the luxury of a stunt double. The baby (who never stops screaming, making stealth next to impossible) is eventually discovered and adopted by a group of people who are either forest dwelling thieves or a socialist dairy farming collective. They thoughtfully provide a clear view of his significant birthmark. Meanwhile baddies, assisted by their mole in the palace (S.A. Asokan) obtain an imposter baby to raise as the prince and legitimise their takeover as regents who will never retire. 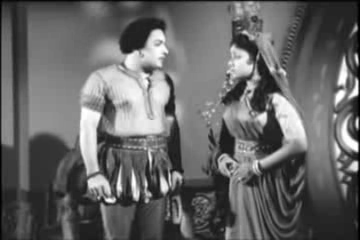 The baby grows up to become Ali (MGR), a Robin Hood figure of laconic charm. 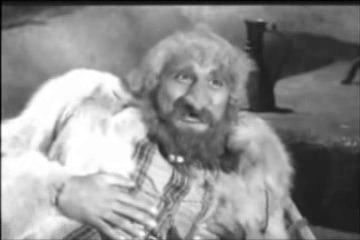 He crosses paths with Zarina who is also a thief. Hijinks ensue as he tries to steal back his takings and Zarina matches him move for move in a game of wits. 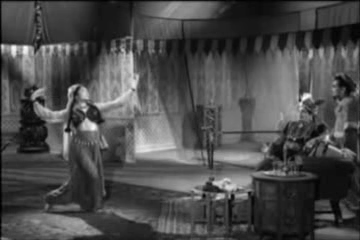 While trying to evade Ali’s pursuit she is mistaken for a dancing girl by the Pretend Prince, leading to a flimsy excuse for Zarina to dance for her life. 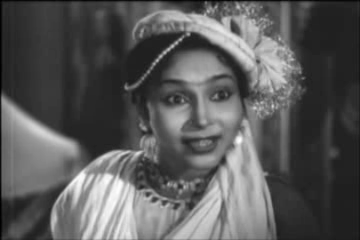 Which is absolutely excellent since she is played by Vyjayanthimala. 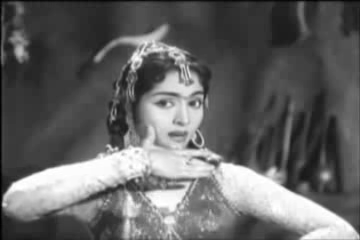 Not a purist classical number by any stretch of the imagination – but Vyjayanthimala dances with her customary precision and strength. 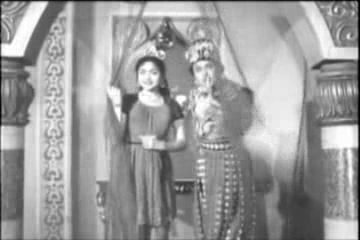 MGR confines himself to comedic fumbling, posing as her backing musician along with his sidekick (T.R Ramachandran). 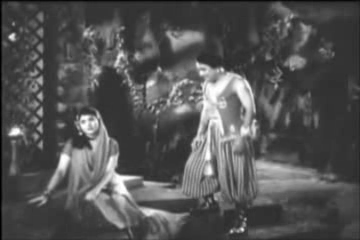 Ali sets up an accident so he can rescue the Pretend Princess (M.N Rajan). She is quite full of herself and the wrong kind of sparks fly. But when he duels his way to freedom she is so impressed by his swordsmanship that the other kinds of sparks are evident, at least on her side. Zarina seems to be living with a thief master type who demands she hand over money each day or else. He sells her at auction and Ali (in a bad disguise) buys her. 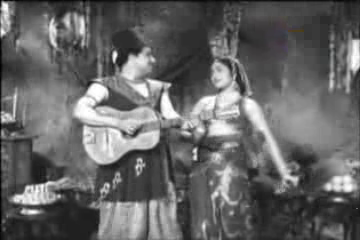 She doesn’t see through the face putty and tries to escape but is foiled – luckily his moustache falls off during a song and she realises she is not unhappy at all. However there are other baddies at large and one day, she is taken prisoner and used as a target for axe throwing practice. Zarina often gets herself out of trouble, but when she can’t she is fortunate to have the ever vigilant Ali. 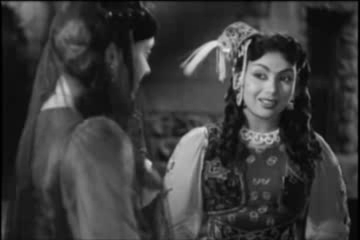 But Ali is still wooing Pretend Princess, a woman of nasty temperament and a love of hats (even her maid is suitably bedizened). She shows him a secret treasure box hidden behind a door of spears and concealed in a fireplace. With all that security it must be something good! He ties her up – maybe just for fun – but then seems to tell her who he really is and gags her as she screams for guards and he escapes. Theirs is a crazy mixed up kind of relationship thing. The box contained the antidote for poison that had been spread into the water supply. So rather than being a duplicitous flirt it seems Ali was taking one for the team. He saves the people! And marries Zarina! So much to be happy about, and yet so much time left for things to go wrong. I liked Ali and Zarina. They had a nice dynamic in their relationship, and while Ali was clearly The Hero who would save the day, Zarina wasn’t dumbed down. She wasn’t very skilled with a sword, but she would still have a go at hacking her way through guards and other obstacles. It was nice to see the couple so playful and happy to be together, and the actors’ rapport came through in their less fraught scenes. 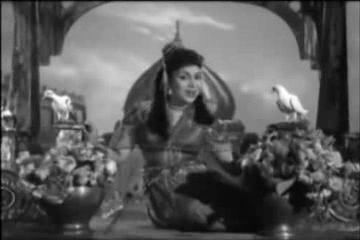 I think the secret of their happiness might just have been that MGR refrains from much dancing and wisely lets Vyjayanthimala do the choreographic heavy lifting. 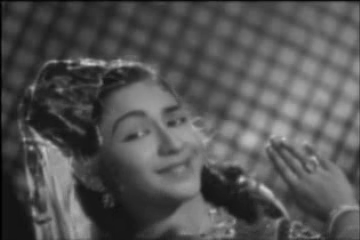 MGR has a nonchalance that makes Ali likeable and not too overbearing. He does leap onto the soapbox and speechify a bit, which suits Ali’s character as the man of the people, but he isn’t too pompous. 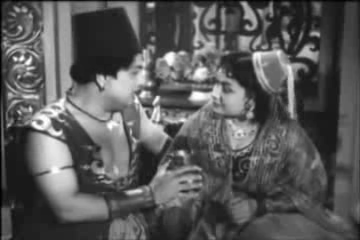 Vyjayanthimala gives Zarina feisty energy with a resilient core, a good match for MGR. In the latter part of the film he changes his look and gives up the fez and harem pants in favour of jolly little Elizabethan style breeches so that was amusing. The Pretend Princess allows herself to be kidnapped with an eye to getting her claws on Zarina. 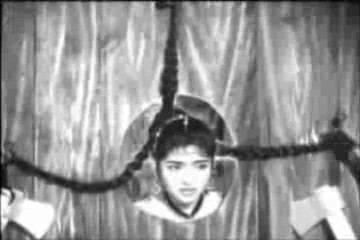 Zarina ends up in the dungeon but Ali gets wind of her situation. 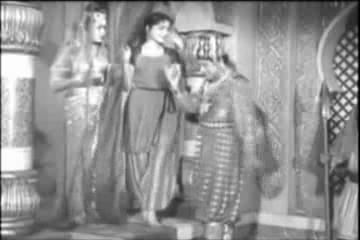 There is much plotting, and a wonderful Batman-esque wall ‘climb’ to rescue Zarina that has MGR using all his overacting skills. 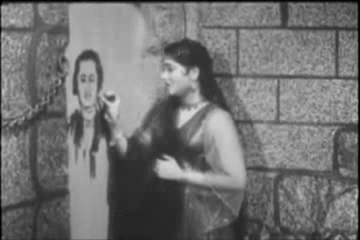 Not to be out-emoted, Zarina paints his portrait in blood as she sings a dirge. 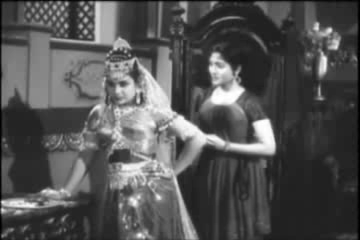 And the baddies celebrate I’m not sure what exactly with a big tribal production number featuring Gopi Krishna. 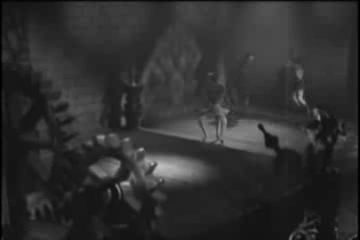 The final action sequence takes place in almost every room of the palace. 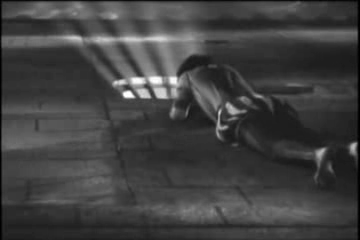 There is an excellent pointless clockwork contraption that can have no function other than being a Masala Death Trap. The Pretend Princess is delighted to find out that Ali is the real prince, and fancies she is in with a chance at keeping her tiara and getting her man. Will he forget Zarina? As if! 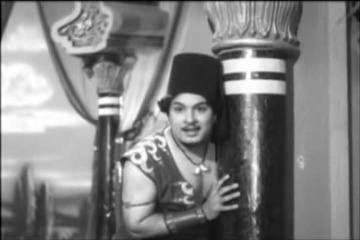 See this for the vintage charm, the ripping story that requires little analysis, and the pleasure of seeing MGR and Vyjayanthimala take on all comers and emerge victorious. 3 1/2 stars! 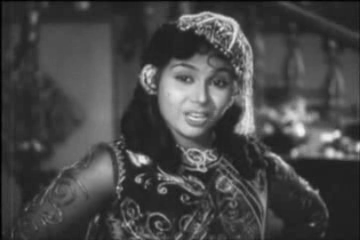 This entry was posted in Kollywood and tagged A Ashokan, A.S Muthu, Adventures without subtitles, Helen, M G Ramachandran, M N Rajan, MGR, S, S N Lakshmi, T.P Sundaram, T.S Balaiah, Tamil, Vyjayanthimala. Bookmark the permalink.